Hello beautiful souls! I hope 2017 has started well for you all! I have a lot going on in the coming months- a vinyl EP release for my project LAIR, finishing my first LAIR album and working on bringing a show to fruition for that, the second EP for my duo noeverything will be released and we also work on our first album together in Sweden in April, plus a lot more music-wise! Please look in on laurakilty.com for more info and to hear my various music projects, sound healing excerpts and meditations! 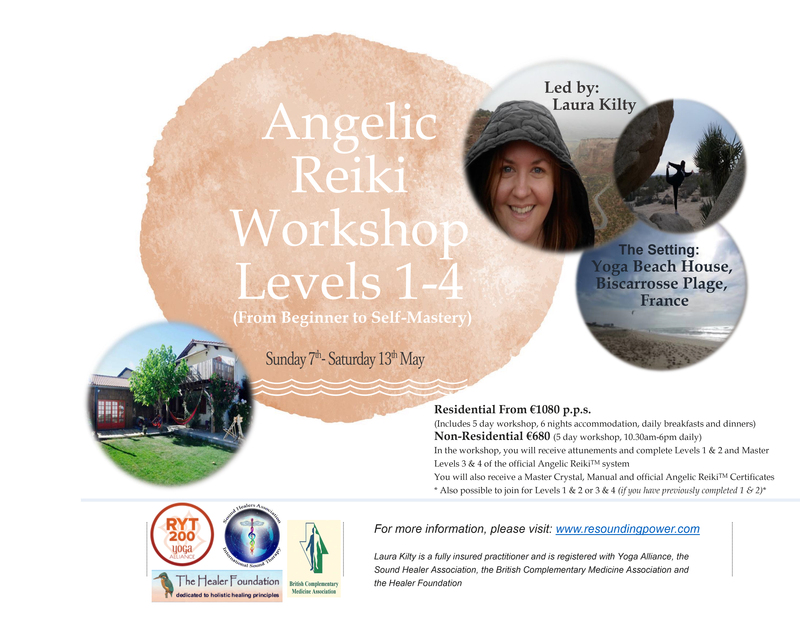 What may interest some of you more is that while I am Europe-side, I will be heading back to the beautiful setting of Yoga Beach House in Biscarrosse Plage, France to run a workshop in Angelic Reiki for those who want to learn how to do it for themselves and also a Wellness Retreat for women over 5o. Both of these are happening in May- the month of Bealtaine in Irish. It is a time where Creativity, Fertility, Birth, Growth and Beginnings (as it was seen as the beginning of summer) were traditionally celebrated. 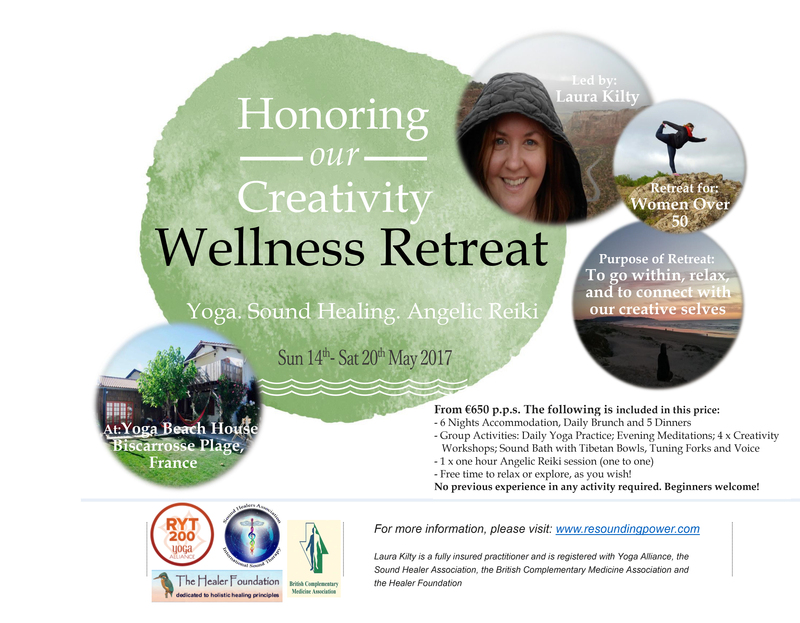 The perfect time for a workshop or retreat that embraces you as a multi-dimensional being! Please see below for a quick-view of what this workshop and retreat will entail and please click on the links to see the pages for each one to get a more detailed look of what they are about and how to book. I am really looking forward to getting back there with the beautiful James and Rachel who own and run Yoga Beach House with much love and care. Hope to see some of you there! This 5 day workshop encompasses Angelic Reiki Levels 1-4, Beginner to Self-Mastery. Please be assured, no prerequisites for this course. Price for the complete workshop: €680. The manuals, your master crystal and official, internationally recognised, Angelic Reiki certificates are all included in this fee. Option to stay in the Yoga Beach House from Sun 7th-Sat 13th with accommodation, delicious, lovingly-made breakfast and dinners and workshop all included from €1080 p.p.s. Book the residential option before March 19th, and receive €50 off your booking! This retreat is for women over 50- a demographic that seems to give so much to others and yet may not always prioritise time for self and relaxation. The aim of this retreat is to return you to your ‘everyday life’ relaxed, recharged and revitalised. Please be assured no previous experience in Yoga or any other activity is needed and complete beginners are welcome to join! Prices start at €650 per person sharing a twin room and go up to €850 for a private en-suite room. This includes 6 nights accommodation at the beautiful Yoga Beach House, daily brunches, 5 dinners, daily yoga classes, nightly meditations, 4 group creativity workshops and 1 individual Angelic Reiki session (60 mins). There will be one afternoon off and plenty of free time every day to relax or explore, as you wish! Book before March 19th, and receive €30 off your booking! This entry was posted on January 23, 2017 by laura kilty in Inspiration, Meditation, Yoga and tagged Angelic Reiki, Bealtaine, Biscarrosse Plage, France, LAIR, Laura Kilty, May 2017, meditation, Movement, music, noeverything, Peace, Rachel Hanberry, Refresh, Relax, retreat, sound healing, Women's Retreat, workshop, yoga, Yoga Beach House.